Carbonite does not have a 2GB-free-forever model like many of its competitors. Instead, they have limited time free trial, more like what you’d get from the major anti-virus vendors. 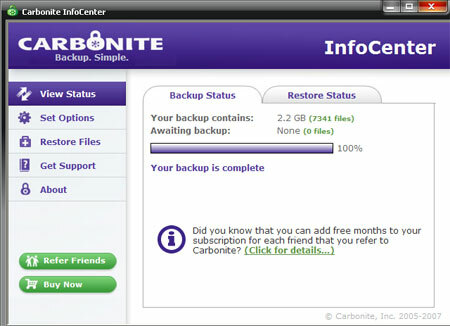 Unlike the 2GB free offers, however, Carbonite gives you unlimited backup space during the free trial period. In fact, Carbonite was the first backup company to offer unlimited backup for a fixed price â€“ an innovation that has been copied by at least a couple of their competitors. The advantage of an unlimited space trial is that it really gives you a sense of the ease of use that is inherent with Carbonite– when you sign up, you literally just put in your email address and password, and Carbonite defaults to backing up all your important files. There are no directory trees to pick from, no deciding about backing up this file or that file, no new UI that you have to figure out. In fact there’s no need to decide anything. Put in your credit card at the end of the trial period, and Carbonite will back up all the user-generated files on your PC automatically, no questions asked. What’s missing from Carbonite? Well, the biggest drawback is that there’s no web interface yet for accessing files in your backup if you’re away from your usual PC. This capability does not, per se, have much to do with backing up your PC or protecting your files, but it is a nice-to-have that some of Carbonite’s competitors offer. Also, Carbonite does not have a version specifically aimed at enterprise customers with centralized administration, proxy support, and other features that a business may need. But at $49.95 per year for unlimited data storage, it’s less expensive than its competitors and a great value by any standards. Update: As of March 16, 2009, Carbonite has started offering web access. Sales channels: Direct to consumer. Marketing partners like Microsoft Money. Affiliate and reseller programs. You can sign up for a free trial with just an email and a password. The installation of the PC software was quick and easy. As part of the installation, Carbonite asks you if you want to keep your own encryption key. They strongly discourage this process, and wisely so: if you lose your own encryption key, your backup is bye-bye. Carbonite will not be able to get it back. When you install the PC software, Carbonite asks you if you want to back up everything in your Documents and Settings folder (the default), or choose what you want to backup you later. The company says nearly everyone just clicks past this and takes the default. The Documents and Settings folder will pick up all the My Documents folders for all users, plus your desktop and most settings, such as internet favorites. Unless you have specifically set up a directory that is not under documents and settings, this default setting should pick up all your files, including email, Microsoft Office, Quicken, and almost anything else you’d have on your PC. As you get toward the end of your free trial period (15 days on the web site, but generally 30 days if you use the offer codes from any of their radio advertisements), a little pop-up appears on your system tray reminding you that it’s time to put in your credit card and pay up. If your trial expires, Carbonite keeps your data for another 30 days before deleting it. Meanwhile, they remind you a couple more times by email and using the system tray pop-up. Once installed, the Carbonite lock icon will appear on the system tray. The lock will be green if everything is operating normally. If you are disconnected from the Internet for more than 24 hours, the Carbonite lock will turn yellow to remind you that your backup is out of date. Also, Carbonite will send you an email notification. Carbonite begins the initial backup as soon as installation is complete. It scans your disk first to make an inventory of what needs to be backed up. All the backup clients do the same thing, but Carbonite seems to be particularly good at staying out of your way if you’re using your PC for other work. Not only do they regulate the CPU utilization, but they also monitor the disk queue since the initial scan is more disk intensive than CPU intensive. We didn’t see this attention to detail in any of the other products we tested. Carbonite backs up all file types except executables (such as .exe and .dll), system files, and temporary files. During the free trial, video files are not backed up. Carbonite is the only online backup product that doesn’t force users to learn a new user interface to change backup selections. Carbonite does everything with Windows Explorer, an application most users already know. If you open Windows Explorer, you’ll see that Carbonite has put little green or yellow dots on the files and folders that are backed up. A file or folder with a green dot has been successfully backed up. A yellow dot indicates that the file or folder is waiting to be backed up. A file that has no dot is not being backed up. By right clicking on any file or folder that is being backed up, users have the option to “Don’t back this up” or can choose “Don’t back up files of this type.” In the example illustrated here, right-clicking on the Word file and selecting “Don’t back this up” will cause Carbonite to not back up this file. Selecting “Don’t back up files of this type” will cause Carbonite to not back up any Word files. This applies to entire drives. You can also select “Back up all files of this type.” Even normally excluded file types such as .exe or .dll can be backed up in this manner. While you do all your file and folder selection (and even Restore functions) from Windows Explorer, Carbonite does have a UI that allows you to change certain settings and check the status of your backup. Clicking on the Carbonite lock on the system tray will open the Carbonite InfoCenter. The InfoCenter displays the status of backup, set options, restore files, etc. The “Set Options” tab allows the user to turn off the colored status dots on files and folders. We’re not sure why you would want to do this because with the colored dots turned off, you really won’t know what’s backed up. Maybe you just assume that everything is backed up and perhaps the little dots annoy some people. Seems like a fairly useless option to us. Normally, Carbonite backs up at full speed. Upload bandwidth is generally limited only by the speed of the user’s Internet connection. Most broadband connections allow 2-3 GB per day of upload bandwidth. Carbonite claims that there is not practical limit to the upload speed other than your own connection and the latency and speed of the various peering points between your computer and Carbonite’s data center in Boston, MA. Carbonite automatically monitors the PC CPU, disk queue, and Internet usage. It’s surprisingly good at getting out of the way if there is any other activity on the PC. When you’re doing anything else on your PC, Carbonite drops down to a low-priority mode and stays there. Once Carbonite sees one minute of PC inactivity, it moves back up to full speed. However, Carbonite cannot tell if other devices are sharing the Internet connection, such as someone else who is trying to use Skype or other VoIP services. The options tab lets the user keep Carbonite in a low- priority mode so that it will be less likely to interfere with other Internet users on the network. 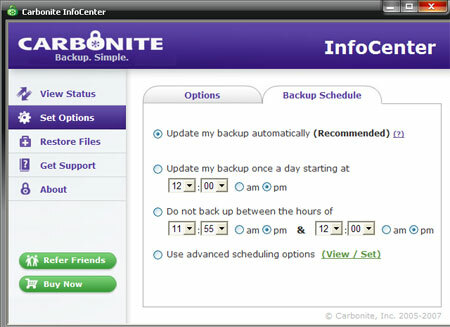 An initial backup will go much slower in Low Priority mode, but after the initial backup, some users keep Carbonite in Low Priority mode at all times. You can also right click on the system tray lock icon and a little shortcut menu appears that lets you change to Low Priority. If you’re really worried about Carbonite taking up any resources, you can either pause it for 24 hours (it will automatically resume) or you can disable it completely. Most Carbonite user probably never look at this option and just leave Carbonite in its automatic continuous backup mode. But users with multiple PCs sharing one Internet connection may want to avoid backups during business hours. So a scheduling option is available. Backup can be scheduled to happen at a certain time, or certain hours of the day can be blacked out. The Advanced Scheduling option lets you create very detailed rules, such as different times of the day for different days of the week. Why you would want to back up at a different time on Monday than on Tuesday is a mystery to us, but the capability is there nonetheless. Carbonite creates a Carbonite Backup Drive that contains all the drives, folders, and files that you’ve backed up. The install process puts a shortcut to the “Carbonite Backup Drive” on your desktop, or you can see it also when you open “My Computer”. Browsing through the Carbonite Backup Drive will be much the same as browsing through your C: drive, except only backed up files and folders will be there. Restoring a specific file or folder is simple and quick. The Carbonite Backup Drive will display everything that has been backed up. (If a file has been deleted from the PC, Carbonite keeps it for 30 days). Navigate to the deleted file (it will be marked as “Original file is Deleted”), right click, and select “Restore”. The file or folder will reappear on your C: drive. Files can be restored to the original folder, or to some other folder. If multiple versions of this file were saved over time, any version can be restored. It will only take seconds for the file to be restored. This feature is particularly useful if you overwrite a version of a document by doing a File Save instead of File SaveAs. Restoring all your files to a new PC (with the same Windows operating system) is also easy. Reinstall Carbonite on the new PC using the same username and password. Carbonite will recognize the new hardware and will automatically go into “recover mode”. Restore Mode waits for the user to complete any restore processes before beginning to back up the new computer or drive. 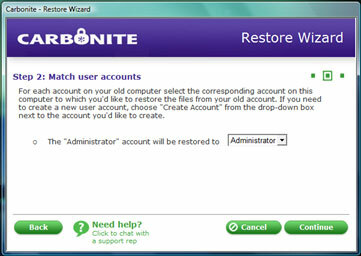 To restore everything in your backup, open the Carbonite Backup Drive, right click on the C: drive and select “Restore”. All backed up files will be restored to the new computer, and the old folder structure will be recreated on the new machine. Unfortunately, Carbonite does not yet have a web access application. So if you’re on a trip to Hong Kong and you left your PC at home but you need a file off of it, you can’t just go into an Internet cafe, log in, and retrieve the file from backup. Carbonite says that they are concerned about the security implications of web access. In order to retrieve a file with just a web browser, the file must be unencrypted before it is sent over the Internet to the browser. In the case of Mozy, for example, you must give Mozy permission to unencrypt your files if you want to use their web access. Carbonite says that they do not want to be in the position of ever dealing with unencrypted files. They are working on a solution for remote file access, but they say that it will probably involve downloading a small application that will decrypt files locally. Because XP and Vista have different folder conventions, Carbonite offers a “restore wizard” that helps put the contents of XP folders into the right place on a new Vista machine. This wizard doesn’t exactly take all the work out of migrating from XP to Vista, but it’s a good start. Considering that a high percentage of people buying new PCs today are probably migrating from XP to Vista, this wizard is pretty handy. And using your online backup is a pretty convenient way to move all your old stuff to your new machine, even if the old machine is still working ok.
Carbonite’s back-end infrastructure uses RAID-6 redundant disk arrays. Essentially what this means is that your data are spread out over arrays of 8 one-terabyte industrial hard drives. You would have to lose 3 of the 8 drives at the same moment before any data is actually lost. (Even then, you still have a copy on your PC, unless it fails at the same moment as well). This is pretty standard data center technology. Carbonite keeps one hot spare hard drive running for every 16 disks. If one of the live disks starts to look flakey (based on predictive software), it is taken out of service and replaced with the hot spare. Carbonite calculates that their servers are 36 million times more reliable than the hard drive in your PC. Most of the backup services we tested claim to have similar redundant storage technology, so Carbonite is in no way out front in this department. But it’s good to see that they’ve thought about carefully and are using time-tested tools to achieve very high reliability. Of all the backup services we tried, if all you want to do is protect the data on your PC from theft, hard drive failures, fire or any other kind of disaster, Carbonite is the cheapest and simplest way to do it. Where Carbonite falls a little short of Mozy is on administrative tools for businesses. Carbonite does not yet have a version of their service specifically aimed at the enterprise. They say they are working on a business product, though. But when it comes to features that an individual user or small office would need, such as private encryption keys, versioning, scheduling, bandwidth management, the ability to select what is backed up at a fine grain level, and a simple recovery process, Carbonite has pretty much everything the competition has. But, they’ve managed to implement it all in a way that is simpler and cleaner than any other vendor out there. We used to back up external hard drives, but we no longer do because we found it to be a recipe for bad customer experiences and a lot of support headaches. Here’s why: Carbonite is a backup service, not archiving. So, if you delete a file from your computer, after 30 days it is deleted from your backup. Suppose you have an external hard drive plugged into your laptop, and you go on vacation, leaving the external hard drive at home. Carbonite sees that all the data on the external hard drive is now missing. To us, it looks like all the data on the external drive has been deleted. After 30 days, we erase the backup. This inevitably leads to an unhappy customer. The other problem is backup speed. Standard DSL connections have limited upload speed– generally about 2-3GB per day. If you have 200GB of files on an external hard drive, it could take 3-4 months to back everything up. Meanwhile your most important files may be waiting in the queue, and if your computer fails before the backup is complete, you won’t be able to get them back. We get blamed. We have no control over backup speed– that’s up to your ISP. But, I can tell you from our earlier experience with external hard drives that complaints about backup speed were 3-4 times higher among people who were trying to back up their external drives. I found Carbonite’s restore process incredibly painful and their support even more — like a root canal. The original restore missed most of my files and it took several days for them to tell me that I had to reconfigure Windows Defender, Windows Firewall and Norton to accept Carbonite — no mention of that anywhere on their site. Their support has limited hours (only until 5 eastern) which is ridiculous when you can’t get to your data. Even after paying an additional $19.95 for “priority” support, I didn’t get the response time I would have liked. While the back up process might work quite well, the proof is in the restore. Not yet ready for prime time! Personally I love SOS Online Backup and their reseller program is AMAZING! The return investment is huge from my first 100GB account. I made 50% share revenue $810 from one single account. Plus the interface is supper easy. A fatal flaw in Carbonite (for me) is that the program does not allow access to backup files from another computer. I have Carbonite installed on my home desktop. If I’m at work or traveling and need to see a file on my home computer, I should be able to go online and view the backup version. The last two online backup programs I had allowed this. So I just assumed that Carbonite did too. Not so. From what I can tell, Carbonite is the ONLY online backup program that does not allow web access to backed up files. According to Customer Support, the only way to do it is to transfer the software to the work (or other) computer, restore the file, unistall the software, and then reinstall the software on the home computer and perform a complete backup. The process is so cumbersome that it’s effectively useless. In my opinion, this should eliminate Carbonite from consideration. Oh, and when I asked about terminating my subscription and getting a refund, they referred me to a no refund policy on their website. That’s after the two days that it took to get a response to my inquiry. Simple backup interface – but failed to restore. The ONLY purpose of a backup service is to support restore. After seven days, multiple eMails, and loads of frustration I have lost every document, every mail message and thousands of valuable photographs. The customer care service is really quite appalling, and frankly – they deserve to go out of business. Avoid this vendor like the plague unless you too want to lose your data. Hidden behind programs and system files. Ouch. Worse, you have to explicitly and individually mark every folder from which you want videos backed up, and it only does one level, not subfolders. So each time you shoot a video and load to a folder on your disk drive, you have to remember to explicitly mark that folder. So much for the “Completely Automatic” that they claim! Who doesn’t want to keep their home movies? I thought I was protected. And now that my disk crashed, I’m left stuck. And my wife is pretty sad (and angry) as well. Kevin N: Iâ€™m sorry that you lost your video. Youâ€™re not the first person to make that mistake. In the next release, weâ€™re going to explicitly warn users when they have videos that are not being backed up. Let me tell you why the policy is the way it is. A couple of years ago, we did include videos by default, and it actually caused even more problems. It turns out that home movies represent just a tiny percentage of all the videos out there. Most of them are commercial movies or TV shows downloaded off the Internet (many with unprintable file names), and the volumes can be huge â€“ like more than 500GBs in many cases. DSL will only let you upload 2-4GBs per day, so backing up all these movies and TVs can take months. Meanwhile, truly important files, like photos, work documents, etc., are waiting in the queue. So if userâ€™s PC crashes before the backup is completed, important files will be lost. Weâ€™d get letters from users with comments like â€œYou backed up all my stupid TV shows, but you didnâ€™t back up my Quicken files?â€ If you make it so that all subfolders are backed up, it didnâ€™t help. Carbonite is unlimited, so everyone just said â€œWhy not?â€ and backed up all their videos, not thinking about the time problem. So we think the best compromise is to very explicitly remind users when there are videos not being backed up. Jim: We do allow web access. If you go to http://www.carbonite.com, and click the “Remote Access” tab at the top of the screen, you can access any file in your backup with just a web browser. This feature came out a month or two ago. John Ryan: Your blog post has me very concerned. Somebody in our customer care team has not done right by you. Please send me an email at david.friend@carbonite.com and refer to my post. We’ll get it straightened out. Let me know the email address you registered under so I can research who messed this up for you. Doesn’t support external drives. Also does not support archiving of files, so deleted data will disappear from their servers after a certain period of time. Last I checked the program it also wouldn’t automatically upload certain file types within a directory despite being told to backup that directory. That’s deceiving and downright annoying. Lack of external drive support and the non-obvious list of file types that it doesn’t backup automatically turned me off for good. I am currently in the 15d trial period and was thinking I would use carbonite but I am glad I have found this site and the comments. You describe Kevin has having made a mistake but your website proclaims very clearly “Completely Automatic”. Clearly it isn’t if I have to go through every folder I have to mark up video and mp3 files as to be backed up. My camera (like many – most?) allows me to take video and so my video clips are scattered amongst my photos! I started going through and marking them but it is taking too long. I couldn’t see an explanation of the green dot with white centre but realise this is a clue as to where videos and other unsaved files are, but there are many falsely marked (including any with an empty folder). The small carbonite window offers an info centre. I clicked to view the tutorial on “how to see or change what is backed up” hoping this would show a shortcut. But I just get a not found message. And why must it open in IE browser window when by default I use Firefox? Since I recently got a video camera the problem of videos being ignored will increase. This leads me to suspect I will not be using carbonite longer term. Off to explore other options. Hereâ€™s how to back up all your video clips with Carbonite. 1) Right click on any video clip. Please let me know if you have any problems with this. Weâ€™re going to make this feature much more obvious in the next release. Also, please remember that we donâ€™t back up videos with the free trials â€“ you have to be a paying customer to back up your videos. I thought to restore working files, like Outlook Email, Quicken, and some Word files I had in progress to another computer while my main machine was in the shop. It turns out I have to install the program (Ok with that) and then find the right place to restore data files to. That turns out to be impossible. Where are the Quicken data files? which ones do you restore to be on the current data? Why doesn’t the Outlook restore work? I spent time with the online chat, which told me the restore had worked fine, then asked for a copy of the log (sent) and then – nothing. I have the main machine back now while waiting for a part, so now I get popups about Carbonite problems. I have to disable the whole thing until I get it straightened out – makes me nervous about what happens in a full disk crash. As a followup to my prior post, I am happy to report that Carbonite responded in less than a day, emailing me a number to call for answers to my questions. I did this and got a reasonable explanation for why special import procedures are needed when using restored files with existing Quicken and Outlook programs running on the temporary computer. They also pointed out that it is possible to access files directly from the backup drive. I have not tested any of these things, since my main machine is back, but I feel more confident about the process, not to mention the level of support. Well done, Carbonite! Am trying to resume backup after a 3 month hold and Carbonite doesn’t seem to want to do that. How do I do it???? I see from your website that you reviewed Cabronite and recommended it. You should know that Carbopnite does not deliver what they promise. I had serious computer problems last spring (2009) and Carbonite worked as promised. I was grateful. In mid-February 2010, more computer problems led to a new hard drive. Long-story-into-short, Carbonite had not backed up my vital .pst file (email, contacts, calendar) since the prior September!!! Carbonite on-line personnel could not help after substantial time on line. Then, their â€œescalation teamâ€ (who took days to call me) could not fix the problem and they could not tell me what had happened, but said it would not happen again. They told me there is no warranty or other remedy for their failure. Since then, I gave up on the old computer (too many problems), got a new one and went to Carbonite to restore my files. Not only did Carbonite not restore my .pst file again, it also restored many, many old files that I had deleted months earlier and did not restore any of my work of the prior several weeks. The on-line people tell me they canâ€™t help and they now are referring me AGAIN to the escalation team who AGAIN will contact me â€“ leaving me hanging. This is outrageous. If Carbonite does not back up their customerâ€™s files (they do not dispute that I selected back up of all files) on a timely basis, they should not be in business. Youshould take real care about continuing to recommend this service. They do not stand by their product and the customer is left holding the bag when they fail. I think it’s time to update this review. The version 4 software is great, and a lot clearer to users. Since this is a backup review site, you owe it to your readers to keep your reviews up to date. I am currently going through the nightmare that others have already described. I am into my 4th day of trying to restore my files from Carbonite. Their technicians are incompitent and God help you if you try to get one of them on the phone. The music (or noise unterference) they play while you’re on hold is enough to make you hang up. I will advise all of my friends and business associates to avoid this scam. I signed up for carbonite in Sept 2010. I was un aware that they did not automatically back up my flip cam videos. Last week my computer died. Well at least I have carbonite! i thought. Nope-I lost all of the videos of my daughter learning to crawl and her first words and learning to walk. Thanks Carbonite. I do not remeber having installed Carbonite but I happened to see it on a normal review of my Control Panel. Why would it be there if never installed? Title was Carbonite Online Backup Settings, Used infrequently, and last used on 5/26/2073. Crazy!!! I’ve now on 1 Apr 2011 insalled it AGAIN but remain mystified. Any suggestions? They remove deleted files after 30 days. How long after someone accidentally deletes a photograph (there are children in the house) before you notice that it is gone? I lost an important spreadsheet, and didn’t notice until carbonite removed it from their systems. I said that they should keep the last version of a file longer than that, and they just pointed me to their stupid 30 day policy. I’m done. I’m going to get a REAL online backup system. A waste of time and money. I lost a power supply which fried my motherboard. Went to restore to a new computer and after 3 days found some of my most important data was not restored. Tech support, while pleasant, was not helpful. I was supposed to receive a call from an “engineer” no call. Just prior to the problem I had done a “backup now” and everything showed it was backed up. Then to top it all off, I was able to salvage my hard drive and had to pay more money to have data transferred to my new computer. there must be a better way! A horrible experience. I used Carbonite for years, expecting I was fully backed up. Then my C: drive crashed. I went to restore, only to find out that 1) Carbonite does not cleanly back up data bases, such as ACT and Thunderbird e-mail, anything that has multiple files. They recommend you use the application’s backup software to make a copy, then compress that into a zip file, then manually back the zip file up. Worse, they only warn their business customers of this limit, saying that the personal version users don’t backup up databases! 2) they backuped only about 1/3 of the files on my 2nd internal drive – it appears all the folders were created by the file backup was sporatic. I will not have anything to do with a software vendor that hides its limits and doesn’t do what it says it will do, especially with something as critical as backup.